Mark's Tickets is the best place to find tickets for New Orleans Saints fans. Just check this page for any new events or schedule updates throughout the year. We sell tickets to every New Orleans Saints game around the world. We know how passionate New Orleans Saints fans can be about football, so we make sure to have hundreds of tickets for every game available right up until it starts. For those looking for cheap New Orleans Saints tickets, we offer tickets starting at very low prices (many times below face value). We offer tickets in most sections of every venue that you can see New Orleans Saints. Simply choose the city or venue that you are interested in below, and you will be able to see all of the available seats. Do not forget that Marks Tickets also specializes in sold out New Orleans Saints tickets. No longer will sold out shows prevent you from seeing New Orleans Saints. The New Orleans Saints are a professional football team that plays in the NFL. The Saints play their home games at Mercedes-Benz Superdome in New Orleans, Louisiana. With 16 games per year, and 8 being home games, The New Orleans Saints are an American professional football franchise based in New Orleans, Louisiana. They are currently members of the Southern Division of the National Football Conference (NFC) of the National Football League (NFL). The team was founded by John W. Mecom, Jr. and David Dixon and the city of New Orleans. The Saints began play at Tulane Stadium in 1967. The name "Saints" is an allusion to November 1 being All Saints Day in the Catholic faith, New Orleans' large Catholic population, and the spiritual When the Saints Go Marching In, which is strongly associated with New Orleans. The team's primary colors are old gold and black; their logo is a simplified fleur-de-lis. They played their home games in Tulane Stadium through the 1974 NFL season. The following year, they moved to the new Louisiana Superdome (now the Mercedes-Benz Superdome, since Mercedes-Benz has purchased the stadium's naming rights through the 2021 NFL season). For most of their first 20 years, the Saints were barely competitive, only getting to .500 twice. In 1987, they finished 12-3 (their first-ever winning season) and made the playoffs for the first time in franchise history, but lost to the Minnesota Vikings 44-10. The next season of 1988 would end with a 10-6 record, proving that the Saints were a competitive team, and that 1987 was not a fluke. 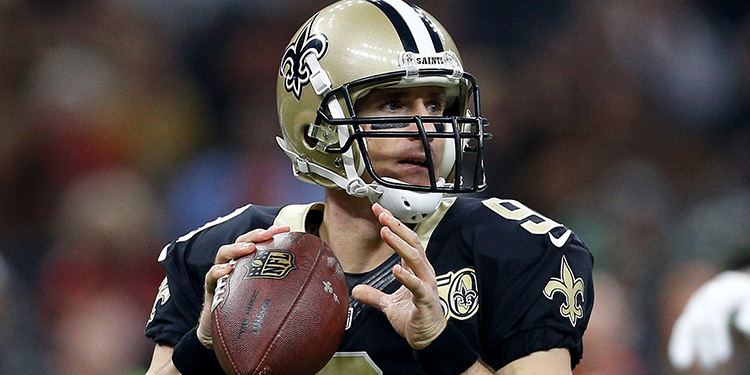 The Saints defeated the St. Louis Rams 31-28 in 2000 to notch their first-ever playoff win. In 2005, Hurricane Katrina devastated New Orleans and, indeed, much of the Gulf Coast region. The Superdome was used as an emergency temporary shelter for displaced residents. The stadium suffered damage from the hurricane (notably from flooding and part of the roof being torn off as well as internal damage), and from lack of available facilities. The Saints were forced to play their first scheduled home game against the New York Giants at Giants Stadium in East Rutherford, New Jersey (the Giants' home stadium); other home games were rescheduled at the Alamodome in San Antonio, Texas or Tiger Stadium in Baton Rouge, Louisiana. During the season, it was rumored that Saints owner Tom Benson might deem the Superdome unusable and seek to legally void his contract and relocate the team to San Antonio, where he has business interests. Ultimately, however, the Superdome was repaired and renovated in time for the 2006 season at an estimated cost of $185 million. The New Orleans Saints' first post-Katrina home game was an emotionally-charged Monday Night Football game versus their division rival, the Atlanta Falcons. The Saints, under rookie head coach Sean Payton and new quarterback Drew Brees, defeated the Falcons 23-3, and would go on to notch the second playoff win in franchise history. The 2009 season was a historic one for the Saints. Winning a franchise-record 13 games, they qualified for Super Bowl XLIV and defeated the AFC champion Indianapolis Colts 31-17. To date, it is the only Super Bowl Championship that they have won, and as it is the only Super Bowl the Saints have appeared in, they join the New York Jets and Tampa Bay Buccaneers as the only three NFL teams to win their lone Super Bowl appearance.